Never 2 old to start cooking goes Italian!!! never 2 old or never 2 young - which is it? When it comes to cooking, it doesn't matter!!! A few weeks back I was asked to demo homemade pasta from scratch to plate. I'd never made pasta in my life, but I welcomed and embraced the challenge. I got a pasta machine, rounded up a few recipes (you'll be amazed at the simplicity and the similarities), and went at it at home a couple of times. Trust me, if you ever liked Play-Doh, you'll love pasta, and the pasta is so much more edible!!! As the demonstration at Sur la Table was winding down, a mother and young child happened in the store. I asked if he liked Play-Doh and got the expected affirmation. 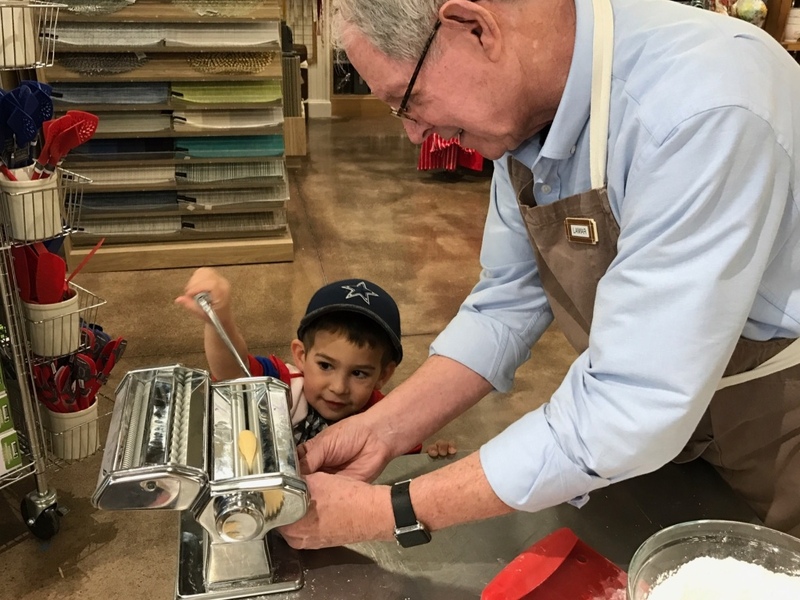 In the spirit of fun I asked if he could help, and with mom's encouragement I got him to turn the handle on the pasta machine for me. He was delighted to take home the resulting finished product. I hope he'll remember our working together for as long as I. Hop over to never2old.net or click on PASTA!!! here or on the home page, for some pasta recipes and tips from a newbie to the world of pasta. Hopefully you'll have as much fun as I do.